The Great Crash of 1929 profoundly disrupted the United States' confident march toward becoming the world's superpower. The breakneck growth of 1920s America--with its boom in automobiles, electricity, credit lines, radio, and movies--certainly presaged a serious recession by the decade's end, but not a depression. The totality of the collapse shocked the nation, and its duration scarred generations to come. In this lucid and fast-paced account of the cataclysm, award-winning writer Charles R. Morris pulls together the intricate threads of policy, ideology, international hatreds, and sheer individual cantankerousness that finally pushed the world economy over the brink and into a depression. While Morris anchors his narrative in the United States, he also fully investigates the poisonous political atmosphere of postwar Europe to reveal how treacherous the environment of the global economy was. It took heroic financial mismanagement, a glut-induced global collapse in agricultural prices, and a self-inflicted crash in world trade to cause the Great Depression. 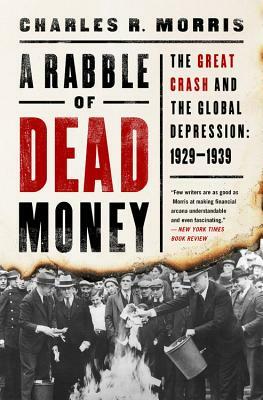 Deeply researched and vividly told, A Rabble of Dead Money anatomizes history's greatest economic catastrophe--while noting the uncanny echoes for the present. Charles R. Morris has written fifteen books, including The Coming Global Boom, a New York Times Notable Book; The Tycoons, a Barron's Best Book of 2005; and The Trillion Dollar Meltdown, winner of the Gerald Loeb Award and a New York Times bestseller. His recent book, The Dawn of Innovation, was named a Wall Street Journal Best Business Book of 2012. A lawyer and former banker, Morris's articles and reviews have appeared in many publications, including the Atlantic Monthly, New York Times, and Wall Street Journal. "Sprightly...Morris is at his best when writing about economic matters, alerting readers to the latest, most authoritative thinking about the causes and realities of the Great Depression."